Pregnancy causes a lot of changes in the body. Pain is one of the most common complaints that women have, especially when the baby really starts to grow quickly at the end. Usually pregnant pain on left side is usually nothing to worry about. However if you have other symptoms such as fever, bleeding, nausea or trouble urinating, you should let your doctor know. Left side stomach pain during pregnancy could be very normal or something your doctor needs to know about. This article will help you learn more about this condition and when you need to be concerned. In the beginning of pregnancy, there is some minor cramp-like pain around 8 to 12 weeks. This is caused by your uterus starting to stretch out into the surrounding muscles. You will have much stronger feeling if this is your first pregnancy. As your uterus grows out of the pelvic area, the muscles around cause a very sharp pain on either side because it has never been stretched that far. The round ligament is the long ligament that connects to the top of the uterus and anchors it down in the groin area. In your second trimester when it begins to stretch up higher, you may feel pelvic pain on either one side. This tends to happen when you get up out of a chair or when you walk. In the later stages of pregnancy, you will notice pain in your joints due to the hormone, relaxin. This hormone causes your muscles and joints to spread apart to make room for your growing baby and the birthing process. You may feel pain in your pelvic area, feet and legs. One common early cause for pregnant pain on left side is implantation cramping and pain. When the fertilized egg nestles into your uterus, there may be some cramping and a small amount of spotting. It usually goes away after a few days. When you are pregnant, hormones cause changes in your digestive system. This can be one leading cause of pregnant pain on left side of your abdomen. The body naturally slows down digestion to get the most nutrients to you and your baby. This is one of the main causes of constipation, bloating and gas pressure that is compounded by the uterus growing larger and pushing on the intestines, which can cause pain on either side of your stomach. One thing you should let your doctor know about is if the pain begins after a high fat meal and radiates to the left shoulder or back. This could be gallbladder or pancreatic issues. When you ovulate, a type of fluid filled cyst can form where the egg left the ovary. This can be painful any time you get one. If the egg becomes fertilized, the cyst can still form on the ovary it came from and you will experience pain on the side it occurred. Urinary tract infections are pretty common during pregnancy and can easily be treated. If left untreated, there could be serious issues, causing pain in the pelvic area near the bladder, burning with urination, back pain and sometimes a fever. Braxton-Hicks contractions can often cause pain and pressure in the abdomen in the later stages of pregnancy. They usually do not hurt too badly, but they do cause some discomfort. Braxton-Hicks are just “practice” contractions and are usually nothing to worry about unless they become quite regular. Another thing that can cause pregnant pain on left side is miscarriage. Between 15% and 20% pregnancies end in miscarriage. 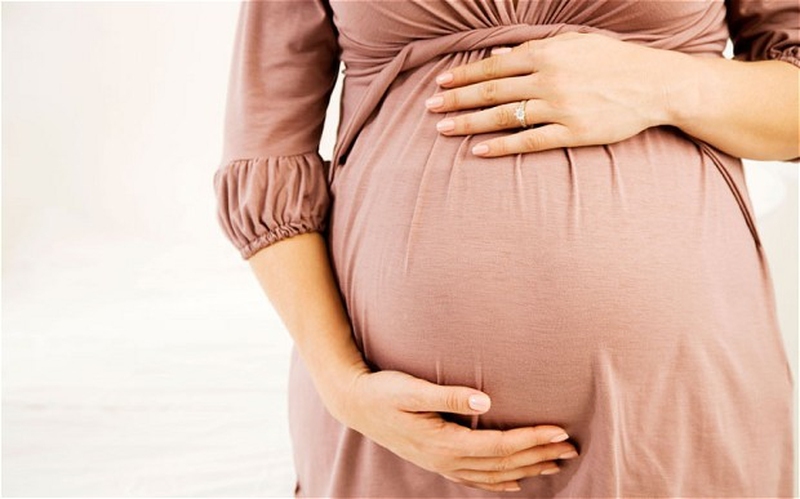 Some before women even know they are pregnant, prior to the 13th week of pregnancy. It usually causes right or left side stomach pain, some bleeding with or without cramping and contractions of the uterus. Ectopic pregnancy can causes pregnant pain on left side. The egg fails to make the trip into the uterus, becomes fertilized in the tube, implants in the tube and begins to grow. This can cause severe abdominal pain on one side. If you have dizziness and severe pain that radiates up to the shoulder, get to an emergency room. If the pain in your abdomen occurs with tightening, you may be having labor contractions. Preterm labor is anywhere before the 37th week of pregnancy and should be evaluated at the hospital. The pain may be accompanied by a dull backache and discharge. Contact your doctor if this type of pain occurs. When the placenta separates from the wall of the uterus before birth, it is known as placental abruption. This can be fatal for both baby and mother and a dire medical emergency. If you have pregnant pain on left side that is very severe and doesn’t get better, it needs to be evaluated immediately. This is a medical condition during pregnancy that causes high blood pressure and urinary protein. It usually comes on after 20 weeks and can be accompanied by abdominal pain, nausea, vomiting and abdominal pressure. It usually requires bed rest and close medical supervision.